Free Trade Agreements (FTAs) are arrangements between two or more countries or trading blocs that primarily agree to reduce or eliminate customs tariff and non-tariff barriers (NTBs) on their imports and exports. The value of imports and exports determine a country’s trade balance, if imports exceed exports, then it has a trade deficit; and if exports are more than country’s import, then it has trade surplus. The Economic Survey (by the Government of India) of 2015-16 stated that since the mid 2000s till February 2016, India’s FTAs have doubled to about 42, which led to more imports than exports. It said, "Increased trade has been more on the import than export side, because India maintains relatively high tariffs and hence, had larger tariff reductions than its FTA partners." The NITI Aayog’s1 “Note on Free Trade Agreements and Their Costs” expressed similar concern that India’s trade deficit with ASEAN, South Korea and Japan has widened, post-FTAs. FTAs generally reduce or remove restrictions that hamper free flow of goods and services between the negotiating nations. This includes tariff (duties, surcharges and export subsidies) and non-tariff barriers (like licensing rules and regulations, quotas and, other requirements like quality standards). However, unlike in the World Trade Organisation (WTO), in FTAs tariff reduction is undertaken with reference to a tariff base rate2 mutually agreed upon by both countries to grant “most favoured nation” (MFN) status to the parties concerned. In WTO, tariff reductions are always from the "bound3 tariff rates" determined by the members as part of WTO commitments, and not from the MFN base tariffs rates. Depending on the bargaining power of the countries involved, FTAs go much further in liberalising trade, services and investments than multilateral trade agreements like the WTO. FTAs are another way to ensure that governments implement the liberalisation, privatisation and deregulation measures of the corporate globalisation agenda. Traditionally North-South FTAs are quite comprehensive and are intended to open up new opportunities for transnational corporations (TNCs) to extract more profits from developing countries. In fact, North-South FTAs are neo-colonial. They turn developing countries into a pool of natural resources or cheap labour for the benefit of northern TNCs. On the other hand, the South-South FTAs (like the India-Sri Lanka FTA) tend to be less comprehensive and less oriented towards an overhaul of national laws, but their impacts on livelihoods of farmers and workers can and have been devastating. However, in recent years the nature and scope of FTAs among Southern (or developing) countries are becoming similar to FTAs between developed (North) and developing (South) countries because other than covering trade in goods (such as agricultural or industrial products) or trade in services (such as banking, construction, trading, education and other public services, consultancy etc. ), almost every FTA today covers intellectual property rights (IPRs), investment, global value chain, government procurement, and competition policy, etc. Therefore, most of the FTAs today go beyond WTO rules and create legally binding obligations on their member/s, restricting their policy space, and have far reaching impacts on livelihoods, access to affordable healthcare, medicines and public services, and protection of traditional knowledge systems. In agriculture, FTAs leads to drastic reduction of import tariffs, facilitate entry of agro-processing and retail firms, and provides for strict IPR provisions that could adversely impact small and marginal farmers, including their rights to save and sell seeds. There are different kinds of FTAs: bilateral, regional or multilateral. India has signed all these different kinds of FTAs. For example, India has separate bilateral trade agreement with Sri Lanka, South Korea, Japan, and Malaysia where both trading partners agree to reduce trade barriers and confer preferred trade status to each other. Some bilateral trade agreements are also for facilitating investment, called “bilateral investment treaties” (BITs), between a home country and a foreign country or a bloc of countries like the European Union (EU). The Regional Trade Agreements (RTAs) are treaties between three or more neighbouring countries that agree to offer more favourable treatment to trade amongst themselves than they do to goods/services from countries outside the region. India has signed an RTA with its neighbours in South Asia in 2004, known as South Asian Free Trade Agreement (SAFTA) in order to improve trade and economic relations amongst the member nations of SAARC (South Asian Association for Regional Cooperation). In the last few years, a new trend has been to negotiate free trade agreements where member countries (i) comprises of more than two; (ii) who are not strictly from the same region or continent; and (iii) the subject matter that goes much beyond the WTO in both coverage and scope. These plurilateral/multilateral trade agreements are referred as “new age” mega regional FTAs not only because of their size in terms of multiple and geographically diverse member countries, but also because of ambitious coverage of issues, which are often referred as ‘WTO-plus’ issues. For example, India is currently negotiating a plurilateral trade agreement known as Regional Comprehensive Economic Partnership (RCEP), which has sixteen members that include ten members of Association of Southeast Nations (ASEAN: Brunei, Cambodia, Indonesia, Laos, Malaysia, Myanmar, the Philippines, Singapore, Thailand, and Vietnam) plus Australia, China, Japan, New Zealand and South Korea. The RCEP negotiations among the 16 nations are moving at a fast pace, and the 25th Round of Negotiations has just concluded in Bali (Indonesia) in February 2019. The RCEP reflects the emerging global trade and economic architecture. The “Guiding Principles and Objectives for Negotiating RCEP” lays down some principles like broader and deeper engagement with significant improvements over the existing FTAs while recognising the individual and diverse circumstances of countries; facilitating countries’ engagement in global and regional supply chains; and taking into account the different levels of development of participating countries. It also identifies the areas for negotiations such as goods, services, investment, economic & technical cooperation, intellectual property, competition, and dispute settlement, with a flexibility to identify other areas. Once the RCEP is finalised, it would be one of the largest trading blocs in the world, covering 45% of the global population, 30% of the global GDP, 27.4% of the world trade in goods, and 23% of the world trade in services. India is already facing severe impact of FTAs in the industrial and agricultural sectors. In last few years, India’s industry groups have constantly raised their concerns on the impact of FTAs with Sri Lanka (1998), Thailand (2003), Singapore (2005), South Korea (2009), ASEAN (2009), Japan (2011), and Malaysia (2011). In almost all these FTAs, imports have grown at a faster pace than exports after the India government agreed to slash tariffs. India's trade deficit with Japan was at $3.6 billion in 2010-11 but rose to almost double at $6.3 billion in 2012-13 after the FTA. Similarly, India’s imports from South Korea increased from $7.8 billion (2007-08 to 2009-10) to $12.1 billion (2010-11 to 2012-13). By comparison, India’s exports to South Korea moved up marginally from $3.4 billion to $4.1 billion and its trade deficit widened from $4.4 billion (pre-FTA) to $8 billion (post-FTA) during the same period. RCEP would be India’s biggest FTA and the country may have to offer much deeper commitments than already made under its existing FTAs with ASEAN, South Korea, Japan, Malaysia and Singapore. India’s largest and oldest apex business body, the Federation of Indian Chambers of Commerce and Industry (FICCI) had demanded for a moratorium on signing of new FTAs. In August 2013, FICCI issued a 12 Point Manufacturing Mandate which said “these FTAs are supposed to provide mutually beneficial results, but experience so far has not been very healthy particularly with regard to manufacturing sector. Hence, it calls for review of existing FTAs and till the time [an] assessment is done Government should have a moratorium on further FTAs”. More recently, on 6th January 2016, the Indian Industry Chambers once again raised their concern against FTAs. In a meeting with the former Commerce and Industry Minister Nirmala Sitharaman, the Industry Chambers said that these agreements benefited the partner nations more. FICCI also repeated its suggestion for a review of existing FTAs before signing of new ones. It said that in many cases, domestic input cost increase is impacting cost of manufacturing while the selling price linked to cost of imports leads to erosion of industry’s pricing power and squeeze in margins to uneconomic levels. In agriculture sector as well, the consequences of FTAs are quite worse. Tariffs are commonly not only reduced (as it is the case in WTO) but most often completely eliminated. After the signing of India-Sri Lanka FTA, the state of Kerala was severely hit by the increasing imports of cheap black pepper and cardamom from Sri Lanka, after these were imported on a duty-free basis. As of 2015, imports of black pepper from Sri Lanka are still high with the price for the cheaper crop variety being $9,500 - 9,750 per tonne against the Indian offer of $11,400 per tonne. The Indian pepper farmers were further hit by the signing of the India ASEAN FTA, with most of pepper imports now coming from Vietnam (the world’s largest exporter of black pepper) and Indonesia. In 2015, Vietnam exported black pepper for $9,800 a tonne and Indonesia for $9,700 - 9,800, which are both still far below the Indian price. The excessive imports of pepper caused a fall in market prices in India. In 2011-12, local black pepper was 240 rupees (INR) per kilo, but fell to 80 INR in January 2016. Other than pepper farmers, the FTA with ASEAN also impacted the India’s rubber growers. Till now more than a million rubber farmers have lost their livelihoods4 due to cheap rubber imports from Vietnam and Indonesia. India was self-sufficient in rubber production until 2013, but is now becoming more and more dependent on imports. Between 2013 to 2015, rubber imports almost doubled from 26 lakh (26,00,000) metric tonnes in 2013 to 44 lakh (44,00,000) metric tonnes at the end of 2015. Exports of rubber are at a record low. India exported a mere 1,002 tonnes of rubber in 2015 against 30,549 tonne in 2013, even as the price of Indian rubber dropped from 207 INR per kilo to 132.6 INR per kilo. Following the signing of the India-ASEAN FTA, coconut farmers in South India also witnessed an unprecedented crisis, with procurement prices of coconut hitting an all-time low of 3 INR per piece. The primary reason for drop in coconut prices was attributed to the cheap import of coconut oil cakes from Southeast Asian countries like the Philippines and Indonesia. Despite these serious impacts of FTAs on Indian industry and agriculture, the Indian government is quite enthusiastically negotiating around 18 more FTAs concurrently, including with the European Free Trade Association (EFTA), the European Union (EU), Israel, New Zealand, Australia, Canada, Colombia, African Continental Free Trade Agreement, Uruguay, Mercosur, and Venezuela. Besides the impact, the process of negotiating these FTAs is also quite problematic and undemocratic—in complete secrecy. During the negotiations, the general public and their parliamentary representatives are denied the right to see any text of these secret trade deals. As a result, none of these bilateral trade agreements faced any kind of stiff opposition from any state government, political party or mass movement. The only notable exception is the India-ASEAN FTA which faced political opposition (from the Left Democratic Front Government of Kerala) as well as resistance from farmers and fishworkers groups of southern India states including Kerala. In India, there is no process of ratification of these FTAs by the National Parliament. In almost every FTA, state governments are excluded from any process of consultation and ratification, even on subjects like agriculture which directly affects their constituents and economies. Like any other FTA negotiation, the RCEP negotiations completely lack any amount of transparency. No text has been made available to the public or to the sectoral groups who would be impacted by this trade deal, like the farmers, women, labour, health groups, and neither were they consulted to assess the impact. Though RCEP covers an extensive range of topics, the 25 rounds of negotiations have been conducted without any public disclosure. Some leaked documents of RCEP negotiations, however, indicate how far reaching the impacts the RCEP will be on the access to medicine, tax policy, investor rights, and farmers’ access to seeds. In last six years5 of negotiations, RCEP was never discussed on the floor of Indian Parliament, nor was any state government consulted. The consultations are always limited to the business communities in the member nations. Another concern is ASEAN, which is at the centre of the RCEP. The 16-member FTA is as much about further integrating ASEAN as a group, as it is about deepening and broadening economic integration amongst the ASEAN Plus Six members. India already has an FTA with ASEAN and it never benefited the country. After signing of FTA, India’s trade deficit with ASEAN surged from $4.98 billion in 2010-11 to $9.56 billion in 2016-17. There cannot be a more cogent statement on the inability of Indian producers to compete with their counterparts in this 16-nation mega trade agreement. It will be a disaster for India’s agriculture and manufacturing sector if it agrees to the 92 per cent elimination/reduction of tariff on products under RCEP. Another big concern is China, which is a key member of this mega FTA. Even without an FTA, India’s trade deficit with China has reached $63 billion in 2017-18, from $16 billion ten years ago in 2007-08. Chinese products have already flooded the Indian consumer market, with the impact most visible in India’s toy industry, lock industry, textile machinery sector, bicycle manufacturing, diesel-engine pump sets and others. A study (2013) by the Associated Chambers of Commerce and Industry (Assocham) on the Indian toy industry stated that, “the Indian market is flooded with Chinese toy imports and that Indian toy manufacturers are being decimated as a result”. Similarly, the Textile Machinery Manufacturers Association (TMMA) objected to the low-cost and low-tech textile machine imports from China, which are between 30 and 50 per cent cheaper. India’s bicycle industry has been drastically impacted by Chinese imports. According to United Bicycle and Parts Manufacturers Association, “Five to six years ago (around 2008-09), the total volume of exports from Ludhiana was about Rs 1,500 crore (15 billion INR). But it is reversed in 2013-14. Export volume has been replaced by imports which range from Rs 1,500 to Rs 2,000 crore" (15 billion to 20 billion INR). Reduction or elimination of tariff under RCEP would drastically impact India’s manufacturing sector. Furthermore, there is another provision in RCEP which restricts India from having any kind of export restrictions on minerals and raw material, which may threaten domestic raw material availability for industrialisation and encourage over-mining. Moreover, RCEP will most likely also bring an end to export bans on food (mainly wheat and rice), which India has used strategically in the past to ensure food security. Another important concern about RCEP is the demand from member countries, especially Japan and South Korea, for ‘TRIPS-plus’ intellectual property (IP) protection for seeds, medicines and agrochemicals. This will be disastrous for Indian farmers because the country is under pressure to accede to the 1991 International Union for the Protection of New Plant Varieties Convention (UPOV)6 and comply with its standards. UPOV is a system of seed patenting that undermines farmers’ rights to save and share patented seeds and plant materials, thus compromising seed sovereignty. UPOV 1991 gives primacy to corporate plant breeders, and restricts freedom of researchers and breeders to access protected plant varieties for further research and development. TRIPS-plus provisions also intensify monopolies over seed, pesticides, fertilisers and animal vaccines, and encourages proprietary agriculture technologies. 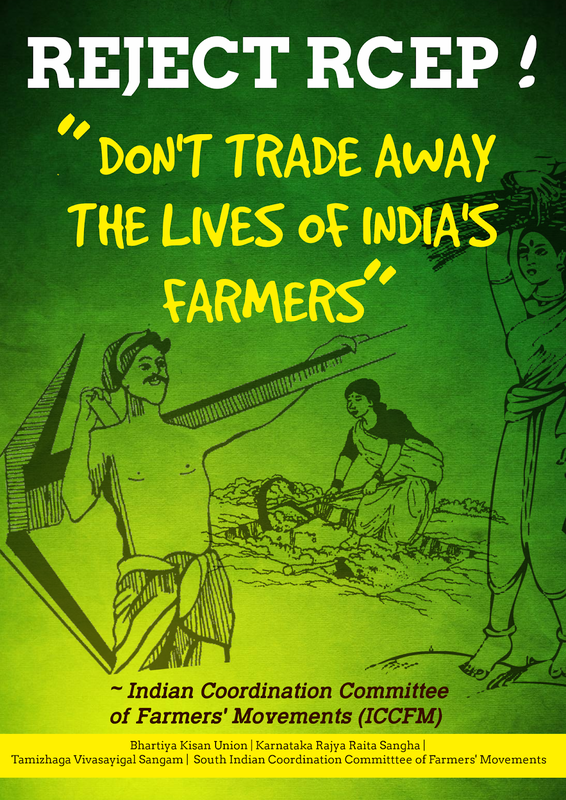 Whilst TRIPs-plus provisions extend the monopoly rights of large corporations, they offer no such protection for the vast amounts of indigenous knowledge held by Indian farmers and local communities. Meanwhile, TRIPS-plus provisions in the health sector would mean agreeing to data exclusivity, extending patent terms as well as allowing strong enforcement measures. TRIPS-plus would also weaken the entire generic medicine sector, as it would make generic medicines inaccessible not only for Indian patients but for those in the entire developing world. This would also limit the ability of the Indian government to issue compulsory licenses on medicines as well as compromise the health safeguards provided under India’s Patent Act, notably section 3(d) which prohibits the evergreening of patents. RCEP’s impact on the dairy industry is another big concern for India. Two RCEP member countries, New Zealand and Australia, have aggressive interest in dairy sector. And if Indian government decides to slash duty on dairy products—especially liquid milk, milk powder [skimmed milk powder (SMP), whole milk powder (WMP)], butter, AMF (anhydrous milk fat or butter oil), and cheddar cheese—the Indian dairy industry will be heavily impacted because all these products are important export products for New Zealand and Australian dairy industry. Compared to India’s 150 million dairy farmers, there are only 12,000 in New Zealand and 6,300 in Australia. India is the world’s largest milk producer, with an annual production of 156 million metric tonnes (MMT), with most of it consumed domestically. There is negligible export of milk or milk products from India. On the other hand, New Zealand produces 22 MMT and exports around 19 MMT while Australia produces 15 MMT and exports 4 MMT. For this reason, dairy corporations like Fonterra (New Zealand) and Saputo (Australia) are looking to RCEP to access India’s massive dairy market to dump their products. India’s dairy cooperatives, like Amul, fear that if import duties on milk and milk products were eliminated under RCEP, it will severely hit not only the dairy industry and cooperatives but also the livelihoods of around 150 million dairy farmers. On the pretext of boosting trade among the sixteen nations, RCEP will undoubtedly deepen corporate concentration in the food and agriculture sector, and offer powerful rights and profitable market to multinational corporations (MNCs). And to protect their rights and investment, RCEP has a provision for investor-state dispute settlement (ISDS) which gives any investor the right to raise claims against a state. If a member does not follow the commitment made under RCEP, a foreign (or domestic!) company has the right to sue the government for damages incurred by the company due to a government policy or intervention. This provision greatly undermines policy space and sovereignty of national governments and places unbridled power in the hands of MNCs. At present, India is already facing around 20 cases of investors suing the government under bilateral investment treaties (BIT). With the RCEP, there is heavy pressure on India to agree to more ISDS provisions. It is expected that RCEP will be finalised by this year (2019) and therefore, there is an urgent need to raise awareness about the harmful impact of this mega FTA among the people. The Indian government must put a moratorium immediately on new FTAs and conduct comprehensive review of all existing FTAs. The Indian government should also conduct an ecological and social impact assessment study to assess the costs and benefits of all FTAs including RCEP, which India is currently negotiating, and make it available for public scrutiny. The Indian government must bring transparency in FTA negotiating process and make all FTAs (including RCEP) negotiating texts publicly available. The Indian government must institute a mechanism for time to time broader public consultations on FTAs with all stakeholders including farmers organizations, trade unions, civil society organizations, and representatives of small and medium enterprises to take their concerns and views. In the spirit of federal polity, the central government must duly consult state governments and gain their consensus on issues that are in the state or concurrent lists such as agriculture, seeds or health. India should not open up for negotiation the critical sectors such as dairy and agriculture; agriculture must be kept out of any FTA negotiations. The coverage of FTAs should be strictly limited. India should not agree to open up 92% - 97% of its goods under any FTA. There should be no 'TRIPS-plus' obligations in agriculture for either data exclusivity or patents on seeds or breeds, etc. There should be no commitment related to mandatory UPOV Convention membership. There should be no patents to be allowed on any seed/planting material-related technologies. Exclude essential public services such as education, health, water and sanitation as well as government procurement from FTA negotiations. End the excessive investor protection and corporations’ right to sue governments, especially for necessary laws that protect their population or the environment. Given that intellectual property are included in the definition of investor rights, no ISDS provisions should be accepted. We also demand for a ratification process for approving FTAs in the Parliament of India. 1This is an updated version of the note prepared for the 4th Kisan Swaraj Sammelan 2018, held at Ahmedabad in November 2018. For more information, please contact afsarjafri@yahoo.com . The National Institution for Transforming India, also called NITI Aayog, the premier policy think tank of the government. 2 Base rate is the applied MFN duty of any year, which is decided mutually. 3 “Bound tariff or Bound duty rate” are highest level of duty notified in the WTO that a country can impose and cannot exceed at any point in time. By contrast, “applied rate” refer to tariff that are actually applied at any given point in time. The basic rule is: applied rate may be lower but must not exceed the bound rate. Hence bound rate have special significance as they limit the ability of a country to vary tariff. 5 The idea of RCEP was first introduced at an ASEAN Summit in 2011. The formal negotiations for RCEP were launched at an ASEAN Summit in 2012. 6Among the 16 RCEP members, only Australia, Japan, Republic of Korea, Singapore and Vietnam are parties to UPOV 1991. China and New Zealand are members of the UPOV but have not signed the 1991 version. Ahead of India’s 2019 parliamentary elections, farmers’ unions from across India have released an 18-point agenda for political parties to include in their manifestos with clear implementation timelines. The poor state of agriculture sector was touted as one of the main reasons behind Bharatiya Janata Party’s loss in recently held assembly elections in Madhya Pradesh, Chhattisgarh and Rajasthan. Rural distress and unemployment were the main influencing factors in the election campaigns before the narrative changed to nationalism, following the Pulwama attacks on Indian security personnel and India’s retaliatory air strikes. Farmers are hopeful that agricultural distress would still be an important issue in the elections. The ruling party’s loss in the assembly elections in December 2018 in five Indian states, reminded parties of how dissatisfied farmers could derail all electoral calculations. 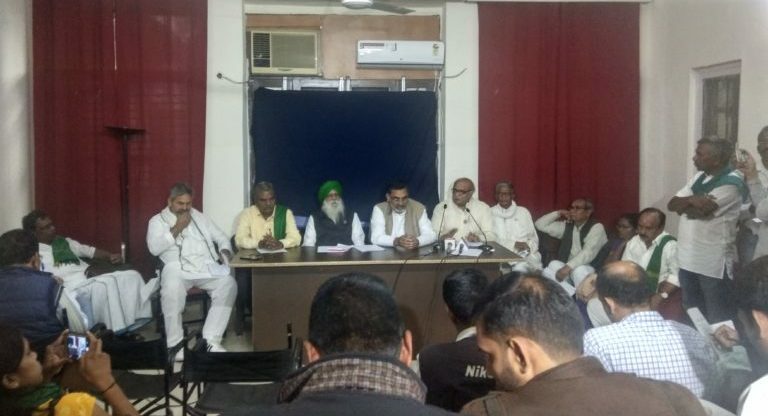 Now, just before India’s 2019 parliamentary elections, farmers’ groups from across the country have come together to present an 18-point agenda outlining their problems and demand political parties to include it in their manifestos with a clear timeline for implementation. 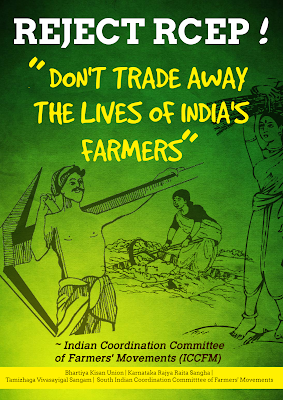 India continues to be a predominantly agriculture-based economy with over sixty percent of the population dependent on agriculture and thus the community’s disenchantment with any party can be a serious cause of concern for it. Over 300 seats of the 543 seats in lower house of the parliament come from rural areas. The link between agriculture and elections was visible in the recent state elections where the agricultural crisis was touted as one of the main reasons for the ruling Bharatiya Janata Party’s loss in Madhya Pradesh, Chhattisgarh and Rajasthan. Last week, the All India Coordination Committee of Farmers’ Movement comprising all the significant farmers unions in India such as the Bhartiya Kisan Union (BKU), Karnataka Rajya Raitha Sangha (KRRS), Tamilaga Vivasaiyagl Sangham (TVS), Adivasi Gothra Mahasabha (AGM) and a host of organisations from across India, released their 18-point agenda demanding all the political parties to include in their manifestos with clear timelines for implementation. The unions have also met and had discussions with representatives of all the major political parties like Bharatiya Janata Party (BJP), Congress, Samajwadi Party (SP), Bahujan Samaj Party (BSP) and the left parties. The unions voiced their displeasure with the Prime Minister Narendra Modi-led National Democratic Alliance (NDA) government and called it a failure for not doing enough to address rural distress. “We have given our agenda to representatives of all major political parties like BJP, Congress, BSP and SP and they have assured to include it in their manifestos. The farmers’ issues are still a top priority in the 2019 elections,” Rakesh Tikait, a farmer leader and national spokesperson of the BKU, told Mongabay-India. Tikait comes from the western region of Uttar Pradesh, an important state for BJP where, in the 2014 Lok Sabha elections, the party got over 70 of the total 80 seats in the state. However, in the past few years, rural distress has worsened, and farmers from all over, including U.P. have been agitating across the country seeking steps for their welfare. The 2019 elections for Lok Sabha of India’s parliament are scheduled to take place in seven phases starting from April 11 and concluding on May 19 while the counting of votes would take place on May 23. What are the demands of farmers? Some of the main demands of the farmer groups include a special parliament session for a month to discuss the agrarian crisis, implementation of the ‘Right to Fair Compensation and Transparency in Land Acquisition, Rehabilitation and Resettlement Act, 2013’ in all states and making land acquisition a central subject rather than state subject. They have sought a ‘fair and remunerative price’ for their farm produce and a guarantee from the government for 100 percent procurement of all crops. Other major demands include an unconditional waiver of all types of loans of all farmers within six months of coming into power, exhaustive changes in prime minister’s crop insurance scheme like including losses caused by wild animals and fires, income support of Rs. 10,000 per acre per year per farmer to all farmers and pension of at least Rs. 5,000 per month, action plan to tackle crop destruction by wild animals, free electricity for irrigation via tube wells, that all equipment used in agriculture be made GST (Goods and Service Tax)-free, a social security scheme for farmers losing life to snake bites and other occupational hazards. The farmer groups of India have come out with a detailed 18-point agenda in the run up to the general elections. Photo by Mayank Aggarwal/Mongabay. They also lent their support to the campaign of tribal people and forest dwellers who are facing eviction from forests after February 2019 Supreme Court order (the Court stayed its order later). In past two years, farmers including tribal people have taken out several protests to ask government to listen to their demands. Held few months before the 2019 Lok Sabha elections, the results of assembly elections in Chhattisgarh, Madhya Pradesh and Rajasthan in December 2018 came as a warning for the ruling BJP whose juggernaut came to a halt as it lost power in all the three states. The government quickly read the writing on the wall and took action. As a result, the 2019 union budget was tailor made to appease farmers and the rural community. For instance, India’s then Finance Minister Piyush Goyal in the 2019-20 budget announced a minimum assured income for farmers. “To provide an assured income support to the small and marginal farmers, our government is launching a historic programme Pradhan Mantri Kisan Samman Nidhi (PM-KISAN). Under this programme, vulnerable landholding farmer families, having cultivable land upto two hectares, will be provided direct income support at the rate of Rs. 6,000 per year. This income support will be transferred directly into the bank accounts of beneficiary farmers, in three equal installments of Rs. 2,000 each,” said Goyal in his budget speech. Goyal added that the programme to be funded by the government of India would benefit around 120 million (12 crore) small and marginal farmer families and would involve an annual expenditure of Rs. 750 billion (Rs 75,000 crores). But the announcement has failed to cut ice with farmers. “Modiji has done nothing for farmers in the last five years and it has been business as usual. Only lofty announcements like ‘per drop more crop’, health-card, neem coated urea were made. The government also promised to double farmers’ income by 2022 but nothing was done on it. In five years, the income of neither farmers nor agricultural labourers has increased,” Vijay Jawandhiya of Maharashtra Shetkari Sangathan told Mongabay-India. “It was the loss in the assembly elections in December that forced the Modi government to announce the support of Rs. 6,000 for farmers. This too won’t benefit all the farmers,” said Jawandhiya. Until last month, rural distress and unemployment had the centre stage in the run up to the 2019 elections. But following the Pulwama attack on Indian security personnel and the Indian government retaliation with air strikes, the election narrative has changed and nationalistic fervour is now in the limelight. “That event somewhat changed the picture. We have to see whether the present wave of nationalist fervour sustains till the voting. We are eight weeks away from the conclusion of polling and it is a fairly long period. The first phase is also about 20 days away (April 11, 2019). We don’t know for how long the nationalistic fervour would continue. But, if things remain the same – which I doubt – as they are now, then rural distress and the declining non-agricultural rural incomes are not going to come back in a significant way in the election narrative,” Mukhopadhyay told Mongabay-India. He stressed that while public sentiment surveys that came post-Pulwama attack have shown the rise of nationalistic fervour and resurgence of BJP, they still do not indicate that the BJP-led NDA government, currently at the centre, will get full majority. In the 543-member Lok Sabha of India’s parliament, one party or a coalition of parties requires 272 seats to stake claim to form government. In the 2014 elections, the BJP alone had won 282 seats. “So, the argument is that even if at the peak level – immediately after the Balakot airstrike (in February 2019 end)– all that BJP would get is 200-220 seats. In case BJP is not being able to sustain the nationalistic narrative, they may again slip back to 180 seats and then rural distress would make a comeback,” Mukhopadhyay added. However, Maharashtra’s Vijay Jawandhiya feels that the changing narrative will push back the issues that he and his farmer community have been trying to bring into focus. .
“The effort to bring emotions (nationalism) in the elections will lead to all other issues going under the carpet. The farmers will continue to die,” Jawandhiya said. Banner Image by David Meek. Please find the invite here. (Harare, March 8th, 2019) The goals that gave rise to International Women’s Day continue to inspire us. They have become the rallying cry of the women and men in all parts of the world who are engaged in organised resistance to capitalism and patriatrchy. This is the reason why, today, in a spirit of unity and solidarity, we, La Via Campesina women from Africa, the Americas, Asia, and Europe fighting for our rights and for life, are taking part in all of the activities and demonstrations organised by rural and urban women workers. This March 8th, we too are going on strike! 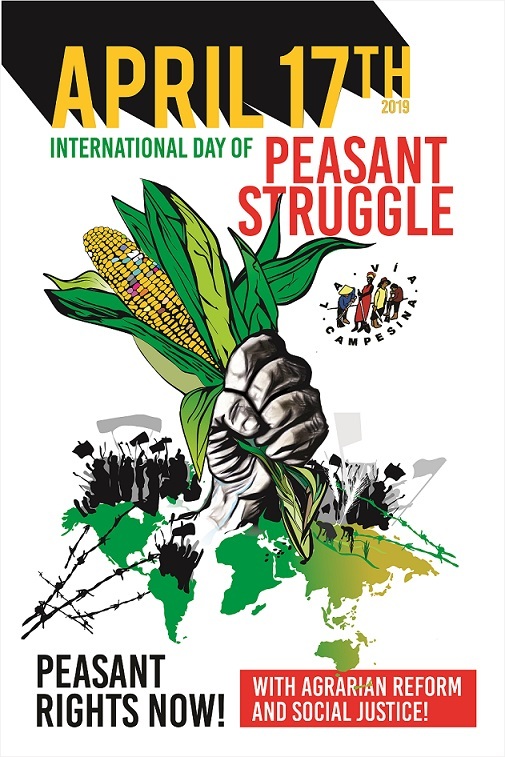 On this day of global action, we will be in the streets and public spaces, in peasant communities and rural areas, imbued with our strength and our capacity for resistance and organisation, re-affirming our message of struggle. In the current world context of an onslaught by capitalism in its most savage and overwhelming form, there have been increases in social inequality, in conflicts, and the incidence of xenophobia and homophobia, as well as in the criminalisation of those of us who are struggling for human rights and for life. In a climate of war-mongering and a context of migratory crisis, millions of people, including millions of women, are subjected to extreme poverty and violence. 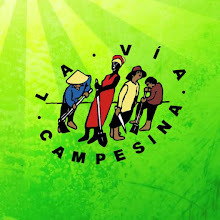 For this reason, we La Via Campesina women are mobilising today, March 8th, 2019, as we have done in years past. We are organising; we are struggling; we are calling for an End to Neoliberalism and an End to the Patriarchy! We are putting forward our proposal for the construction of abetter world, celebrating our Declaration on the Rights of Peasants and other People Working in Rural Areas, a political instrument that was adopted by the United Nations as a result of our concerted struggles. This declaration safeguards the right to a life with dignity for those of us who feed the world’s peoples, and who are the custodians of land, water, and forests. For us, La Via Campesina women, food cannot be commodified in a globalised market that is driven solely by profit and that leaves millions of people hungry. For us, food production should be grounded in Food Sovereignty that is built on agroecology. In this context, we are the principal actors, promoting peasant agriculture on the basis of respect for the rights of peasant women and men. This would require a change in regional policies for rural areas, accompanied by a feminist perspective – a popular peasant feminism that guarantees the rights of women and ensures their participation in political decision-making. We believe that in order to end gender-based violence it is essential to empower women and to guarantee their rights and bring about their emancipation. This is why the women and men of La Via Campesina, in a single expression of struggle and liberation, are saying today: For the life and dignity of women, we fight together against exploitation and oppression! We remain firm in our mission of planting the seeds of hope and liberation for rural and urban women all over the world. We are therefore expressing our sisterly solidarity with all of the women of the International Women’s Strike, the aim of which is to show that women’s work is a crucial element in the maintenance and reproduction of life and of the global economy. Only through social organisation and through training and political study, in cooperation with other feminist organisations of women and women workers, will we be able to advance towards a dignified life for women and men. For the life and dignity of women, we fight together against exploitation and oppression! There are a number of pillars that underpin the human centric approach to land rights and identification of land needs. Among them are the legal right to hold land that can be used for agriculture and habitation and the right to access the public resources (commons) that are situates around the area one lives and works in. Moreover Article 14. 1. h of the Sri Lankan Constitution states that a Sri Lankan citizen has the right to live in any part of the island (freedom of movement and of choosing one's residence within Sri Lanka.) The ownership of land is of great importance to Sri Lankans because this is directly linked to their social and economic conditions. However the land rights of Sri Lankans and their right to access public resources are being swiftly curtailed. The government is preparing national physical plans that lay ground work for 'development projects' that do not take into account the impact they will have on the people. They are also amending legislation and drafting new laws that would enable foreign companies to own large swaths of land and resources, which were once considered public. This will effectively make millions of Sri Lankans into 'refugees' in their own countries. This project of displacement of the local populations and opening doors to global capital at the expense of Sri Lankans is now a few decades old have already degraded the economic, social, health and education levels on many Sri Lankans. However the people of the country does not seem to have understood the gravity of the danger they face, even those who have already been displaced. Moreover the Department of the Land Commissioner General's Department circular 2015/07, issued on December 30, 2015 titled Alienation of State Lands for Special Investment Protects attempts to fasten the process of handing over state land to 'special projects'. This says that 'the government adopts a policy of encouraging local and foreign direct investments in development projects and accordingly the government is in the receipt of continuous applications and requests for lands identified for such development projects. The government has paid its special attention on the comments made by the investors on the inefficiency and the long period of time spent for the process of alienating lands through the present procedures formulated in accordance with the existing laws. A set of new proceedings have been introduced to amend the existed procedures by my circular No.2012106 dated 18.1A.2012 with a view to ensuring efficient and expedite alienation of lands for development oriented special projects.' This circular has been sent to all Divisional Secretaries and Deputy/ Assistant Land Commissioners (Inter Provinces.) This is also a part of the World Bank recommendations. The 2018 budget was fully geared to implement the World Bank recommendations. The budget documents state that the government plans to amend the Paddy Lands Act, No. 1 of 1958 and the Agricultural Lands Act (No. 42 of 1973). This would allow the use of paddy lands for non-agricultural purposes. The people must be vigilant because such attempts would be aplenty on the 2019 budget as well. On November 14, 2017, The cabinet of Ministers agreed to amend the Land Development Ordinance 1935 (No. 19 of 1935) to easily release the land for development projects. The Executive Board of the International Monetary Fund (IMF) on June 03, 2016 approved a three year Extended Fund Facility (EFF) of approximately USD 1.5 billion for Sri Lanka to 'support the balance of payments (BOP) position and in support of the government’s economic reform agenda.' This fund was tied to conditions, i.e. 'strategic reforms' that the government should carry out to address six main concerns on the short and medium term. A detailed report on how to accomplish this was published on May 19, 2016 as the Staff report for the 2016 article iv consultation and request for a three year extended arrangement under the extended fund facility. These reforms fell under six pillars, fiscal consolidation; revenue mobilization; public financial management reform; state enterprise reform; transition to flexible inflation targeting under a flexible exchange rate regime; and reforms in the trade and investment regime. The Staff report also states that the existing land laws of the country was too complex and restrictive and recommends immediate action to amend these laws and to make it easier for companies to acquire land (remove barriers to foreign investment entry and establishment (including access to land). The current administration is implementing these recommendations steadily. The economic policy of the administration, Vision 2025 document and the 2018 budget proposals were directly aimed at carrying out the recommendations of World Bank and the IMF. The 2018 budget attempted to change land ad agricultural laws to and make it easy for market mechanisms to wreak havoc. According to the Vision 2025 document, the existing laws and regulations on land creates inefficiencies in the land market and adversely affect the investment opportunities. Since the existing laws and regulations hampers private investments, the government is to create a Land Bank and enter into the competitive land market. This is exactly what the World Bank recommended in 2015. This is another indication that the government is bent on reducing the public access to land and natural resources while opening these to large scale private investors. Moreover steps have been taken to lease out state owned land to private owners through 'state enterprises restructuring, and to allow large foreign companies to access Sri Lankan lands by establishing land banks. Thus the real goal of the 2018 budget has been to accelerate the dispossession of Sri Lankans. Although the current administration and those before it have taken great pains to carry out the recommendations of the World Bank and the IMF, none of the administrations have attempted to establish the National Land Commission. This Commission was created by the 13th amendment to the Constitution. However although 32 years have passed no government has attempted to establish this. The 2nd list under the 9th schedule to the Thirteenth Amendment to the Constitution states that a National Land Commission should be established. The main objective of the National Land Commission is to create a national policy on land. Although this amendment was passed in 1987, the National Land Commission has still not been established. The 3rd sentence of the 2nd List states a number of things. Accordingly the government should establish a National Land Commission and this Commission is responsible for coming up with a national policy on the use of state land. This Commission must also include representatives of all provincial councils of the country. The National Land Commission should have a technical secretariat that will help it analyse the socioeconomic factors regarding land use as well as physical factors of natural resources management. The national policy on the use of state land should be based on technical reasons and not on political or ethnic reasons. The National Land Commission must look at factors including soil, climate, rainfall, soil erosion, forest cover, environmental factors and economic utility and formulate common theories on land use. Moreover the Provincial Councils were instructed to pay close attention to this national policy. All governments were legally bound to implement these. However unfortunately the National Land Commission is limited to the constitution. The current administration is following the advice of the World Bank and the IMF. Therefore it is unlikely that they would reach the goals set by the 'Maithri Governance - A stable Country or the Sustainable Development Goals (SDGs), a collection of 17 global goals set by the United Nations General Assembly in 2015. The SDGs are part of Resolution 70/1 of the United Nations General Assembly. Goal 2 of the SDGs is Zero hunger. This states that by 2030 we should end hunger and all forms of malnutrition. This would be accomplished by doubling agricultural productivity and incomes of small-scale food producers (especially women and indigenous peoples), by ensuring sustainable food production systems, and by progressively improving land and soil quality. However it's obvious that this lofty goal can't be achieved by exposing our lands to the chaotic forces of markets. The SDGs state that the best way to eradicate world poverty by 2030 is by ensuring that all men and women, especially those from vulnerable communities, have access to economic resources, essential services, land and other natural resources, necessary technology and to financial services. But the World Bank insists that poverty can be alleviated by expanding opportunities for investments and by bringing in natural resources under market forces. However given what we have seen in Sri Lanka and across the world, it is obvious that the outcome of following World Bank and IMF advise is displacement of small holder farmers. Adhering to these policies ensures that we will lose our natural resources that are vital as catchment areas and as cushions that protect us from the impacts of natural disasters. The 15th SGD is protecting, restoring and promoting sustainable use of terrestrial ecosystems, sustainably managing forests, combating desertification, and halting and reversing land degradation and halting biodiversity loss. The SDGs also aim to conserve and restore the use of terrestrial ecosystems such as forests, wetlands, dry lands and mountains by 2020. However the current administration is attempting to sell off the natural resources to foreign investors and depriving Sri Lankans the access to our public goods. There are two options that lie ahead. Either we can follow the path laid by the World Bank and the IMF, which is the one we have been treading since 1977. The other one is the path laid out by the SDGs. It is obvious that the current administration has chosen the path laid by the World Bank and the IMF and this would ensure that we keep on destroying our environment as well as livelihoods of the most vulnerable among us. The government doesn't have the right to sell natural resources of the country, this includes land as well. According to the Supreme Court case 884/99, (Bulankulama and Others v. Secretary, Ministry of Industrial Development and others) where the SC stopped the sale of the Eppawala Phosphate mine, a government is only a temporary guardian of the country. A government does not own the country. A temporary guardian does not have the right to sell land and other natural resources of the country. Therefore it does not have the right to formulate laws that facilitates this process. The sovereignty of the people is temporarily given to a government through a vote. However the people do not transfer their fundamental rights to the government. Thus a government can't deprive the people of their right to land, their right to use commons, their right to access natural resources and the right to water. The real owners of state owned lands are the people and such land should be given wisely and to people who do not have access to land. The objective of the government should be the wellbeing of the people and the development of the nation. Being a land sale agent is not the best way to achieve these goals. The SriLankan government is attempting to place 981, 368 acres of land under the Land Reform Commission in a land bank. This is one of the preliminary requirements to enter the land market and give private investors an access to state land. With this plantation land is to be given to large companies for non - agricultural purposes. This attempt must be defeated soon. If not a large number of people, from estate sector workers to small holder farmers will forever be shut out of land ownership. Thus defeating the land bank act as well as other attempts to deprive the people of their social, economic and cultural rights should be defeated. For this we need to educate the people and their mobilization.